Professional specialized in foreign trade, management, construction and leadership of goal-oriented teams, combines business and educational aspects. Bachelor of Administration with a Master's Degree in Marketing from the National University of San Marcos; advanced program studies BID / ADEX. More than 20 years of experience in business management and foreign trade, occupying management positions in leading companies in the country. 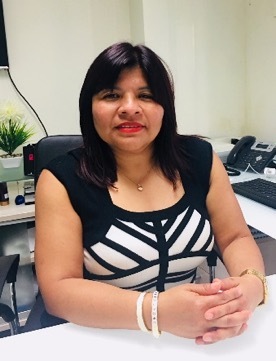 She served as Senior Advisor of the economic sectors in the Financial Intelligence Unit of Peru, former Certification Manager of origin in the Association of Exporters (ADEX), expert in issues of trade agreements, tariff classification, customs, import and export. She also teaches university at the UNIVERSITY OF LIMA, ADEX and ISTECEX in matters of Customs, Sectoral Import and Export Workshops. She is currently an entrepreneur, business consultant, teacher and jury of University Thesis.